Fotodiox Macro Extension Tubes are a wonderful substitution for expensive macro lenses, enabling you to convert almost any lens into a macro lens at a fraction of the cost while maintaining its original optical quality. By placing distance between your camera body and lens, focusing distance is shortened and the magnifying effect of your subject is created. Macro tubes increase the lens-to-sensor distance, allowing for closer focusing than what is normally allowed by the lens itself. The greater the length of the extension tube, the closer the lens can focus. This means you can now get macro performance without needing to switch to a specialized lens and you will retain all the normal benefits of your optic when the macro function is not in use. 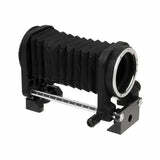 The camera mount coupling adapter and lens mount coupling adapter can be used independently of the extension tubes or you can add in the tubes for extreme macro photography. Because no other optical components are added with this kit, the image preserves the original optical properties of the lens. 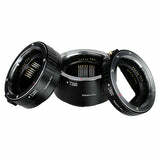 This is an affordable and simple way to turn your existing lens into an inexpensive macro lens. 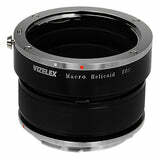 This tube set includes a lens-coupling ring and a body-coupling ring; three extension tubes of various sizes are also included to build up to the desired magnification. Life size image can be achieved with this set up. • If you cannot focus on the subject, it is possible that you have too many tube sections in place, which is putting the focus plane within the lens itself. Start with just the lens and body mount and add the tubes in starting with the smallest first until you get the magnification and focus range you are looking for.